Real lokoum (pronounced ‘lock-hume’), or ‘Turkish delight’ as it’s known in the west, is quite different from the version you get here in the UK. For a start it’s not all about rose or citrus flavours, and it’s usually firmer and less sweet. Due to the simplicity of the ingredients, authentic Turkish delight is also gluten free and suitable for vegans. We’ve carefully selected six different flavours of Haci Bekir’s world famous lokoum to take your experience of our coffee to a whole new level. They include pistachio, mastic, clove, date selection, cinnamon, and rose, and come packaged in pretty boxes of 200gr, all hand cut (so some pieces are larger than others). 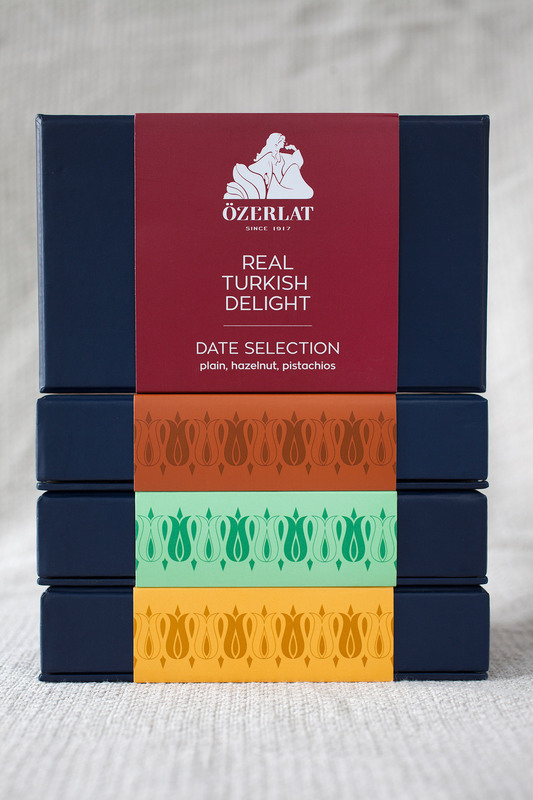 Each box is a single flavour, so as not to let the stronger flavoured Turkish delights overpower the subtler ones. We believe lokoum was made to go with coffee. Bite a piece, let it melt on your tongue, then take a sip of dark, sumptuous Turkish coffee and the complex flavours just envelop your senses. This is by far the most popular lokoum flavour, and with reason. The balance between the soft, sweet Turkish delight and the delicate roasted pistachio pieces is just so gorgeous (and addictive). The most traditional type of lokoum, these Turkish Delights are enriched with the gum of Greek mastic trees. Mastic imparts not only a silky texture, but also its uniquely herbaceous, resin flavour. The clove flavour is so unexpected in these sweets: aromatic at first, then more complex while the lokoum melts. As the layers of flavours unfold, you take a sip of our coffee and it all makes perfect sense. Another unexpected treat from Haci Bekir's spice range, these indulgent delights put the warm, comforting flavour of cinnamon in the spotlight. The spice is gently released as the sweet lokoum melts, slowly revealing all its evocative aromas. Perhaps surprisingly, date is a recent addition to the lokoum art – another of Haci Bekir's modern triumphs. The dense sticky richness of date works so well in the sugary Turkish delight. Inhale the scent of history and savor the exquisite tastes of nature artistically reflected on confections.